The organising committee decided to engage the team as volunteers and currently 8 of them have signed up as liaison officers for each of the provinces that are taking part in the kids festival. 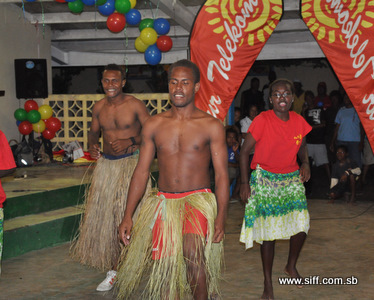 Organising committee member, Maria Rarawa, explained that the Solomon Islands Football Federation (SIFF) saw it fit to involve the youth leaders because it is in line with what they learned at the Pacific Youth and Sports Conference. “We are extending to them another opportunity and we are so glad that they have taken it with both hands. SIFF was heavily involved in sending them to the youth conference and in the kids festival they can practice some of the things they learned,” Mrs. Rarawa said. Members of the team that are working with SIFF in the kids festival program are Jaqcueline Kausimae, Polycarp Bonave, Antoinette Miniti, Johan Doiwale, James Egeta, Alison Ragomo, Peter Auga and Nelson Rorea. Their duties include assisting the schools with information, ensuring transport for the schools for matches is on time and also as ad hoc coaches. They also ensure that any student who feels unwell is brought forward for medical attention. One of the volunteers Ms. Kausimae said that working with kids festival teams is an enjoyable engagement for her as a volunteer. “I see this as an important opportunity for us youth leaders. We can actually contribute to the learning of these children by how we behave around them,” Ms. Kausimae said. SIFF General Secretary Eddie Ngava said that SIFF is proud to work with the leaders of tomorrow and give them the opportunity to practice their roles in the community as adults. “We promised these youth leaders that we would involve them in our national events and we are fulfilling this promise with the kids festival. We hope that the hard work of these young people can encourage other youth to step up and take a leadership role in the communities,” Ngava said.